Warning: This book was banned by the Catholic Church when it was released. If you think it could compromise your faith, don't read this book.? Unlock The *Ultimate Power* To Attain Almost Anything With The Master Key System.?? Clear, concise, comprehensive, definitive, distinctive, cogent, and scientific presentation of the creative power of thought for everyday use. The book teaches principles, causes, effects, and laws that underlie all attainment and success. The master key shows in simple terms, how to achieve practically anything you want in your life. Nature compels us all to move through life. We could not remain stationary however much we wished. Every right-thinking person wants not merely to move through life like a sound-producing, perambulating plant, but to develop - to improve - and to continue the development mentally to the close of physical life.? This development can occur only through the improvement of the quality of individual thought and the ideals, actions and conditions that arise as a consequence. Hence a study of the creative processes of thought and how to apply them is of supreme importance to each one of us. This knowledge is the means whereby the evolution of human life on earth may be hastened and uplifted in the process.? Humanity ardently seeks "The Truth" and explores every avenue to it. In this process it has produced a special literature, which ranges the whole gamut of thought from the trivial to the sublime - up from Divination, through all the Philosophies, to the final lofty Truth of "The Master Key".? The "Master Key" is here given to the world as a means of tapping the great Cosmic Intelligence and attracting from it that which corresponds to the ambitions, and aspirations of each reader.? Every thing and institution we see around us, created by human agency, had first to exist as a thought in some human mind. Thought therefore is constructive. Human thought is the spiritual power of the cosmos operating through its creature man. "The Master Key" instructs the reader how to use that power, and use it both constructively and creatively. The things and conditions we desire to become realities we must first create in thought. 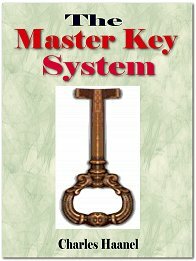 "The Master Key" explains and guides the process.? "The Master Key" teaching has hitherto been published in the form of a Correspondence Course of 24 lessons, delivered to students one per week for 24 weeks. The reader, who now receives the whole 24 parts at one times, is warned not to attempt to read the book like a novel, but to treat it as a course of study and conscientiously to imbibe the meaning of each part - reading and re-reading one part only per week before proceeding to the next. Otherwise the later parts will tend to be misunderstood and the reader's time and money will be wasted.? Used as thus instructed "The Master Key" will make of the reader a greater, better personality, and equipped with a new power to achieve any worthy personal purpose and a new ability to enjoy life's beauty and wonder.? It is my privilege to enclose herewith Part One of The Master Key System. Would you bring into your life more power? Get the power consciousness. More health? Get the health consciousness. More happiness? Get the happiness consciousness. Live the spirit of these things until they become yours by right. It will then become impossible to keep them from you. The things of the world are fluid to a power within man by which he rules them.? You need not acquire this power. You already have it. But you want to understand it; you want to use it; you want to control it; you want to impregnate yourself with it, so that you can go forward and carry the world before you.? Day by day as you go on and on, as you gain momentum, as your inspiration deepens, as your plans crystallize, as you gain understanding, you will come to realize that this world is no dead pile of stones and timber, but that it is a living thing! It is made up of the beating hearts of humanity. It is a thing of life and beauty.? It is evident that it requires understanding to work with material of this description, but those who come into this understanding, are inspired by a new light, a new force, they gain confidence and greater power each day, they realize their hopes and their dreams come true, life has a deeper, fuller, clearer meaning than before.? 1. That much gathers more is true on every plane of existence and that loss leads to greater loss is equally true.? 2. Mind is creative, and conditions, environment and all experiences in life are the result of our habitual or predominant mental attitude.? 3. The attitude of mind necessarily depends upon what we think. Therefore, the secret of all power, all achievement and all possession depends upon our method of thinking.? 4. This is true because we must "be" before we can "do," and we can "do" only to the extent which we "are," and what we "are" depends upon what we "think."? 5. We cannot express powers that we do not possess. The only way by which we may secure possession of power is to become conscious of power, and we can never become conscious of power until we learn that all power is from within.? 6. There is a world within a world of thought and feeling and power; of light and life and beauty and, although invisible, its forces are mighty.? 7. The world within is governed by mind. When we discover this world we shall find the solution for every problem, the cause for every effect; and since the world within is subject to our control, all laws of power and possession are also within our control.? 8. The world without is a reflection of the world within. What appears without is what has been found within. In the world within may be found infinite Wisdom, infinite Power, infinite Supply of all that is necessary, waiting for unfoldment, development and expression. If we recognize these potentialities in the world within they will take form in the world without.? 9. Harmony in the world within will be reflected in the world without by harmonious conditions, agreeable surroundings, the best of everything. It is the foundation of health and a necessary essential to all greatness, all power, all attainment, all achievement and all success.? 10. Harmony in the world within means the ability to control our thoughts, and to determine for ourselves how any experience is to affect us.? 11. Harmony in the world within results in optimism and affluence; affluence within results in affluence without.? 12. The world without reflects the circumstances and the conditions of the consciousness within.? 13. If we find wisdom in the world within, we shall have the understanding to discern the marvelous possibilities that are latent in this world within, and we shall be given the power to make these possibilities manifest in the world without.? 14. As we become conscious of the wisdom in the world within, we mentally take possession of this wisdom, and by taking mental possession we come into actual possession of the power and wisdom necessary to bring into manifestation the essentials necessary for our most complete and harmonious development.? 15. The world within is the practical world in which the men and women of power generate courage, hope, enthusiasm, confidence, trust and faith, by which they are given the fine intelligence to see the vision and the practical skill to make the vision real. ?